Bay maximum tobiano. All white except her head and tail tip. Chocolate Dip, Picture by Amanda Geci. Bay tobiano with unusual face marking. Got Milk, 2015, Picture by Amanda Geci. 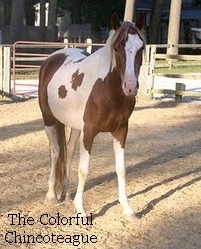 Chestnut tobiano+sabino with a heart marking. Misty's Heart of the Storm, Picture courtesy of Matt DesJardins. Bay tobiano with a horsehead marking. Mini Me By The Sea, 2007, Picture by Amanda Geci. Brown tobiano with three heart markings. Sweetheart, 2010, Picture by Amanda Geci. 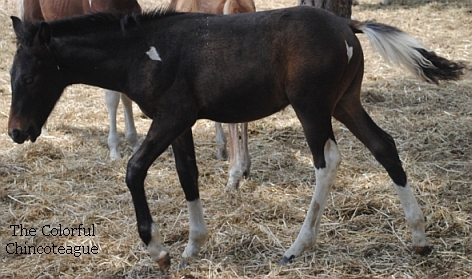 Black pinto with a half white half black face. 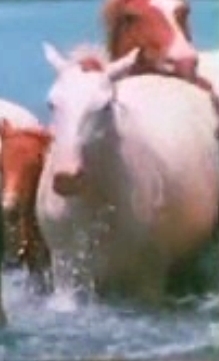 Wild Pony, Picture from a 1967 Wild Kingdom episode. Odd face marking. Wild Pony, Picture from a 1983 Baltimore Sun photo. Solid bay with blue eyes. 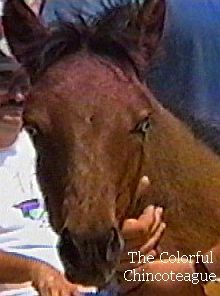 Wild filly, 1996, Picture by Amanda Geci. 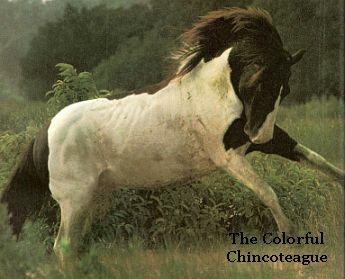 Chestnut almost all white pinto. Wild Pony, 1967, Picture from a Wild Kingdom episode. Maximum black tobiano. Feral stallion, 1974, Photo by James L. Stanfield from The Wild Ponies of Assateague Island. 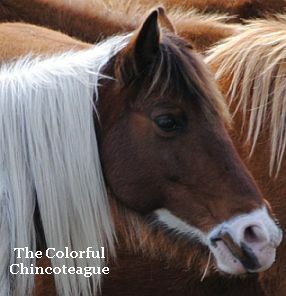 Medicine hat, tobiano+splash. 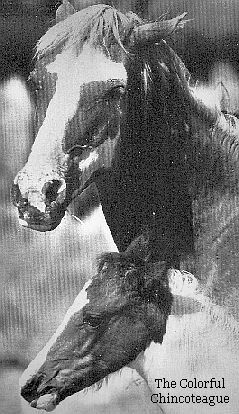 Feral foal, 1977, Photo by Joseph Spies from Wild Ponies of Chincoteague. 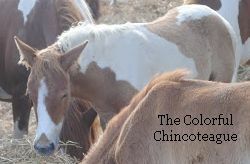 Chestnut tobiano with a colored snip. Chance, 2010, Photo by Amanda Geci.